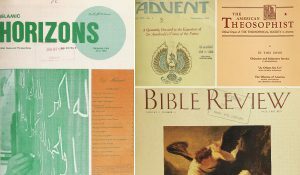 The Religious Magazine Archive is a collection of 22 periodicals that represent a variety of religious traditions. The coverage of the entire collection ranges from 1845 to 2015. Contents include The American Theosophist, The Catholic World, Islamic Horizons, and The Sikh Messenger, among other titles. More popular than scholarly, these magazines show how religious traditions have communicated with current and potentially future adherents. Questions about this resource? Ask a Librarian!